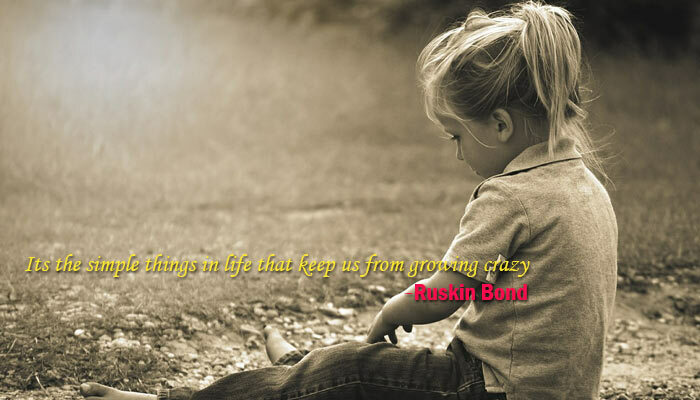 Its the simple things in life that keep us from growing crazy. The above quote rings true to me every time I read it. Little things in life, many times overlooked, often form the most precious moments of our life. Like one thing I remember most about my holiday at an Himalayan Village, is how my room used to fill with sunlight…waking me up, which made me quit using alarms, which I, living in a metropolitan city at that time, took as something indispensable to life. Another time I stayed in a forest and could see the stars from the overhead window as I used to lie on my bed, and could literally count the stars as I dozed off to sleep. These were little things, yet used to fill me with so much joy! So many other such simple and little things have the power to bring us totally in the present moment and make us feel happy and content in that moment. Holding a warm coffee mug for a little too long in winters; eating your favorite food, bite by bite, savoring its taste; a day with nothing to do, an interesting book to read and some great food! An unexpected call from a dear old friend; a hug from a loved one, when you really need it; keeping your head on the shoulder of your loved one and feeling secure, loved and protected. Inhaling deep to take in the scent of earth, when it rains after terrible heat or blissfully bathing in the sun, when sun shines after many cold and dreary days. There are innumerable such tiny little things, which we overlook when we sit down to “evaluate” whether we are happy in life or not. We keeping waiting for big things to happen, and in this wait, forget to give importance to so many beautiful moments that happened or are happening to us! And in waiting for something big to happen…life just slips by!! So many years have passed and many more will similarly pass…and we, keep waiting. It must have happened with all of us that when we think about our past, surprisingly, its not only the big things but infinite tiny little things that bring a smile on our face. I still remember how pleasing it would look when I used to drive home on days when Diwali was just around the corner, every building, shop and neighborhood glittering with lights and there is festivity in air which just catches on you or the time when we were free spirited kids and used to bathe in rain for long long time or the time when my mother used to pick me from school. Beautiful…heart warming moments…the ones I managed to savor to the fullest while they lasted, I think I did justice to them…as for others, they just slipped by. And from all this, one thing that I learnt is to savor every moment…every little thing as much as I can. No matter if its the smallest thing as the aroma of the new soap I bought or watching an all time favorite movie again!